Gold has always been associated with luxury. 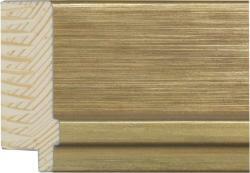 The Wessex range of gold mouldings not only covers the traditional gold colour but also some of the more modern copper and bronze colours all adding a warmer tone to any furnishings. The extensive range goes from brighter gold foils to the more subtle gold leaf finishes, many with undertones of colour to perfectly match your artwork or interior. Available to collect at any of our 6 branches, via the Wessex delivery service or by national carrier the Wessex range of plain gold mouldings are the perfect choice for the professional framer.